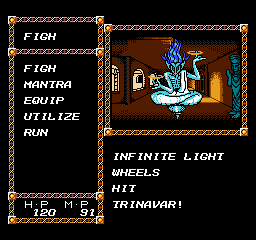 Maharaja is an adventure game for the Nintendo Entertainment System. Maharajah! 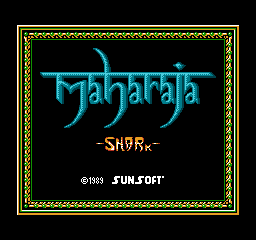 This is the BETA translation patch for Maharaja c. 1989 Sunsoft Famicom/NES adventure RPG. Venture through time to ancient India in this exciting text and graphic RPG! The wicked sorceror Indrajeet is conjuring the demon Ravana who threatens the cosmos, the princess, and all of humanity. Taraka, a great demon and his three sons guard the pieces to a divine weapon that can defeat Ravana. 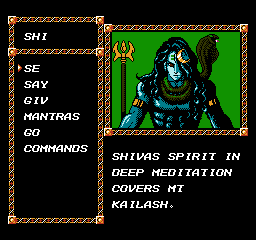 With magic weapons, mantras, and Shiva at your side defeat demons and wild beasts in jungles and ruined palaces! this PATCH is beta which means that some spell, monster, and item names may be abbreviated due to space limitations. Refer to readme for full names.